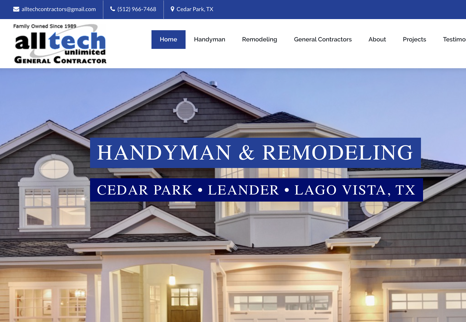 When it comes to a handyman company these days, there’s one thing for certain…you need a Handyman Website to grow your business. Perhaps in the past the yellow pages or a local ad in the newspaper may have worked, but today people are turning to Google to find new contractors and home maintenance companies. Having an online presence is a must in order to compete. In addition to a website, it’s important to have up to date business listings, a social media presence, good customer reviews and much more. It’s not just about throwing up a quick DIY website and calling it a day – it’s a strategic approach with a handyman marketing plan in place to dominate your local market online in order to generate a good flow of leads. ContractorWeb can help you grow your handyman business using a variety of online marketing methods. We don’t just build websites…we build the path to online success for your handyman business. Our web design team ensures that your website is fully SEO-Optimized to rank high in the search engines. Once you’re up and running, our SEO specialists will start working their magic with strategic handyman marketing services. They’ll employ a variety of tactics including Search Engine Optimization (off-page and on-page), Listing Management, Social Media, Pay Per Click and more to drive leads to your business!